Drs. Robert J. Dorin and Robert H. True believe informed patients experience the most satisfaction in their results. Here, we provide short answers to some common hair loss questions we hear from patients. 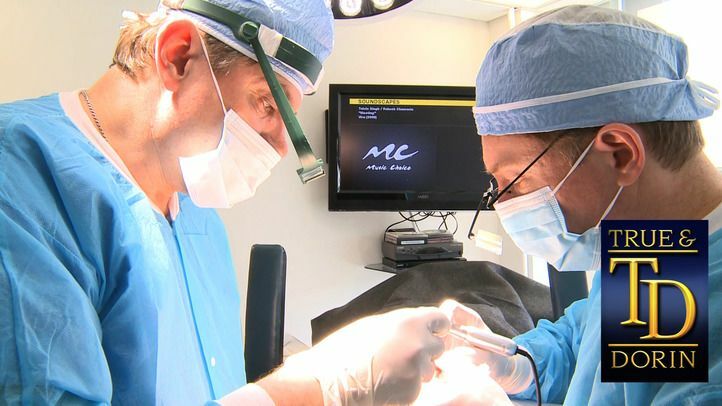 Years of research and experience in both FUE and follicular unit transplantation (FUT) not only allows us to deliver great results, but also minimize the appearance of scars. The thin, linear scar resulting from FUT can easily be concealed with longer hairstyles, while scarring at the individual extraction sites involved with FUE is typically indistinguishable after surgery. How much density can I expect? Generally, our doctors can restore balding areas to 40-50 percent of their original density. To put this in perspective, most patients are not even aware of thinning until they have lost 50 percent or more of their hair's original density. During the procedure, we will provide a combination of mild oral sedation and local anesthesia to keep you relaxed and ensure treatment is as comfortable as possible. Following treatment, patients often experience mild to moderate discomfort which can typically be managed with over-the-counter medications. Will the transplanted hair look artificial? Can a hairline be detected? Our doctors reproduce all aspects of follicular unit architecture, which helps deliver the most lifelike hair restoration available. Patients can expect to achieve a fuller, more youthful, and very natural-looking hairline. Is treatment safe? What can go wrong? Treatment is considered to be very safe. As with any type of surgical procedure, there will always be some degree of risk and infection, numbness, and discomfort can occur. However, at True & Dorin we follow the highest standards of safety to minimize any type of risk associated with treatment and recovery. Why does FUT & FUE look better than other older transplantation methods? Older techniques used large slits or round grafts to place hair in the donor area, which could produce clumpy-looking results that were often compared to a doll. Microtechnology techniques, such as FUT and FUE, mimic natural follicular units which contain just one to four hairs each. What happens if I lose more hair and all I have left is the transplants? In some cases, patients may require additional treatment. However, the transplantation of hair follicles provides an overall thicker appearance, which means that even if additional hair is lost, patients will still have a fuller head of hair than they had prior to treatment. Should I wait for better technology to come along? There will most likely be newer technologies that will be discovered in the future. However, many of these are still many years out, which means that patients could be left waiting for a substantial period of time before they can commence treatment. What do transplants look like as they begin to grow? Roughly seven months after surgery, the new hair follicles will begin to appear, just as your natural hair begins to grow. This will result in a substantial cosmetic improvement that is virtually undetectable from natural hair. The cost of hair transplants can vary, depending on various factors, including the type of treatment and severity of hair loss. On average a single hair transplant session will cost between $5,000 - $15,000. FUE is more expensive per graft than FUT due to the dynamic of the process. The best method for each patient is discussed and determined at your consultation by one of our doctors.